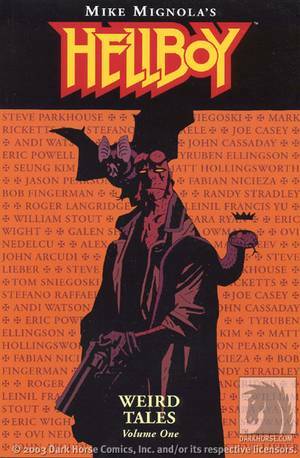 Mike Mignola's award-winning series Hellboy has been lauded as much by other artists as it has by award ceremonies and fans. Over the years, many of the best artists in the industry have asked if they could do a backup story, just to get a chance to play with the characters and worlds Mignola has created. As Dark Horse gears up for the release of the 2004 Hellboy motion picture, we present this lavish collection of these stories. One of the most popular features in recent Hellboy books has been the sketchbook section, so we've asked these stellar artists to let us present some of their behind-the-scenes work in this collection. Collecting issues #1 through #4 of the bimontly series. Some of the best writers and artists in comics team up to present stories of giant bats, demon children, jet packs, haunted circuses, and rusted-out spaceships. Old-fashioned pulp fun featuring one of the greatest heroes of modern comics. * Mike Mignola's ascent into the upper-echelon of comics creators continues as fans eagerly anticipate the release of the major motion picture Hellboy! * Some of the top writers and artists in today's world of comics provide their take on Hellboy.